grant funded musicians who are invested in contributing to the next generation of musicians of San Antonio. values of the program which include building self-confidence, personal responsibility, accountability and fun. instruments awarded by the Charitable Foundation at Guitar Center, Robot Monster Guitars, and Private donors. 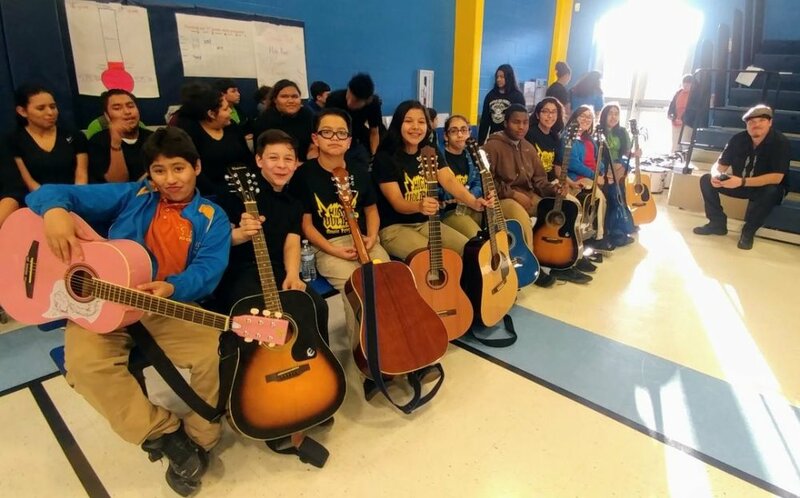 the on and off-campus program and is committed to helping the Community youth that don’t have means or a way to play music to be able to through her hard work and dedication. The program has now produced 5 bands and several students ready to move into the performance category. ***Note: We accept Monetary, Electri Guitars, Bass, Drums, Cymbals, rides, high hat and stands, amps, cords, guitar stands, guitar straps, cases, gig bags etc., that are needed as this program grows. Hello All! I know it's been a while since we used our GoFundMe as a fundraising platform, but there is a need for funds that are not easy to get through the many grants we apply for as a small organization that's doing BIG things! Since our 2016 inception we have done a lot including collaborated with many youth organizations in events, expanded to 3 more area High Schools totaling 4, played various venues including: Paper Tiger, Francis Bogside, Southtown 101, Lavaca Studios and more! We created and hosted our first Independent Event, in the Fall of 2019 'Teens on a Mission' showcasing our talented students and inviting Teen acts, Artists, Vendors and Community Partners to come in and distribute information to our teen audience. We look forward to our next 2 upcoming 2019 TOAM events scheduled in May at Texpop and Nov. at Paper Tiger. We now have 6 performing groups/bands including: Power Punk Rockers Z-Pocalypse, Pop Rockers D.A.T.E., Female Trio Femme among the others. Last, we are preparing for our off-campus Classes that will span over 8 weeks this coming Summer teaching beginning and beginner/intermediate classes in Electric Guitar, Bass, Drums, Vocals and Songwriting. All of this at NO COST to the Student. 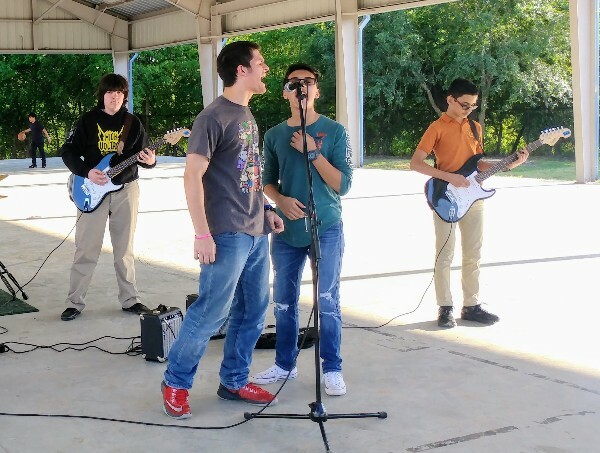 We are STILL a FREE Music Program teaching music lessons, managing bands and throwing events for 13-19 year old Teens in the San Antonio area! Please consider donating to our program and supporting our Mission to enrich the lives of our Youth through the Culture of Music. Hello, we have just been informed that our funding has been cut for the rest of this school year. We are having a fundraiser on June 10 at Francis Bogside from 4-7pm to help with our Free Summer workshops we offer to area teens. I have just had major surgery and still have several weeks of recovery, so i am hoping that you will share this and help us replenish some funding for the summer and to help us through the beginning of the next school year as we navigate through doing what we can to able to continue these classes next school year. Where there is a will there is a way and we will apply for grants, but often times they taka a moment to submit and get approved ,so we are asking for help from our community members now. Thank You! 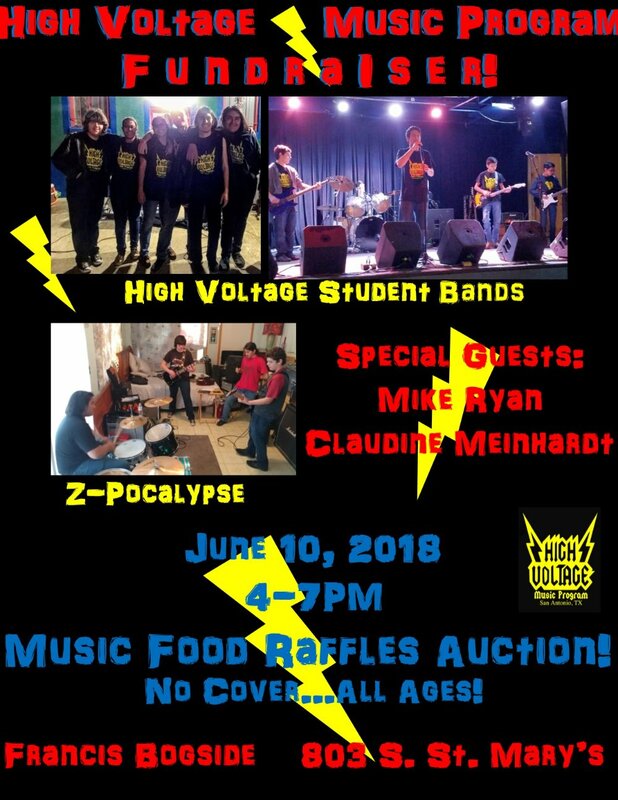 Fundraiser flyer for June 10! Students prepare for a performance! Hello Everyone, I know it's been a long time since we've updated our page, because we've been so busy! As we're coming toward summer, we are looking for support for our FREE Summer Workshops that we offer Teens 13-18 years old. These workshops consists of acoustic and electric guitar, bass, drums, vocals & DJ. Teens may take one or all of our workshops, which also include in a nutritious meal. It's important to keep our teens busy through the summer months and engaged with peers in a positive environment. 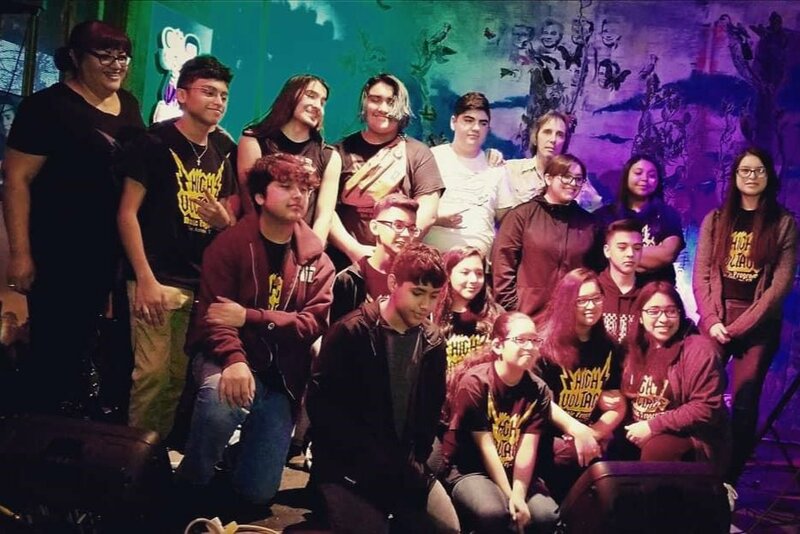 Also, we're currently looking for funding, support and sponsorship for our large annual fundraiser entitled "Teens on a Mission: Showcasing Rock and Roll, Art and Culture. 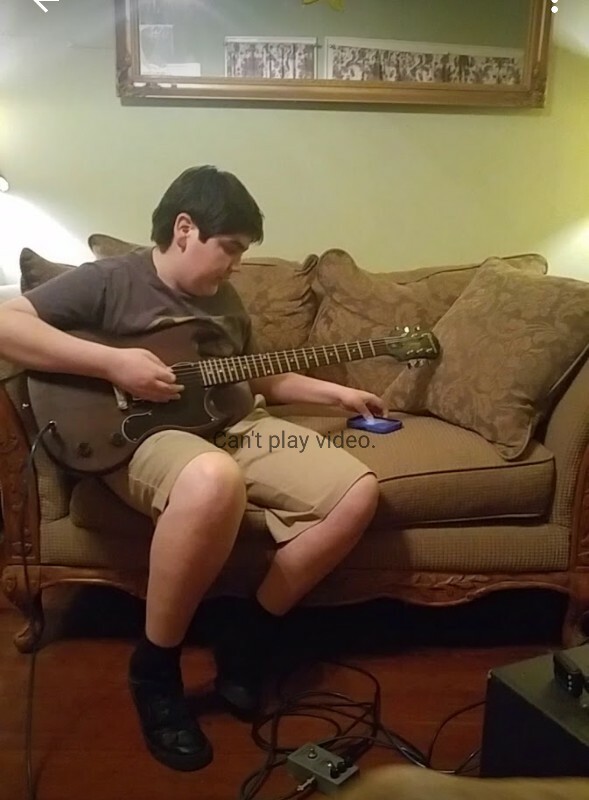 Teens will be able to show their talents through music and art. We will have a full outdoor art gallery, teen vendors and teen entertainment, along with some popular headliners. This is a free community event and your support would be greatly appreciate it! Students perform during the IDEA S. Flores Fiesta! Hello everyone, as we are coming into Summer we will be having Free Music Workshops for San Antonio area Teens from 12-17 yrs old. Please check out our facebook page this week to see the Summer schedule. We are in need of funds for operational costs, snacks and supplies, as we hope to keep Teens busy! We're excited to be offering them a variety of Musical instruments, as well as having a 3-day DJ workshop! We appreciate your support so far and ask that you consider helping us once again by donating or sharing this page with your friends and family. 4 of our students played a Talent show! No, THIS is the last donation of 2016. Happy holidays and I'll donate again soon. Good luck!